Aviation Updates Philippines - Awarded as the World's Leading Airline recently, Etihad Airways is introducing three new weekly frequencies to Manila, Philippines from Abu Dhabi, United Arab Emirates starting May 1, 2016. 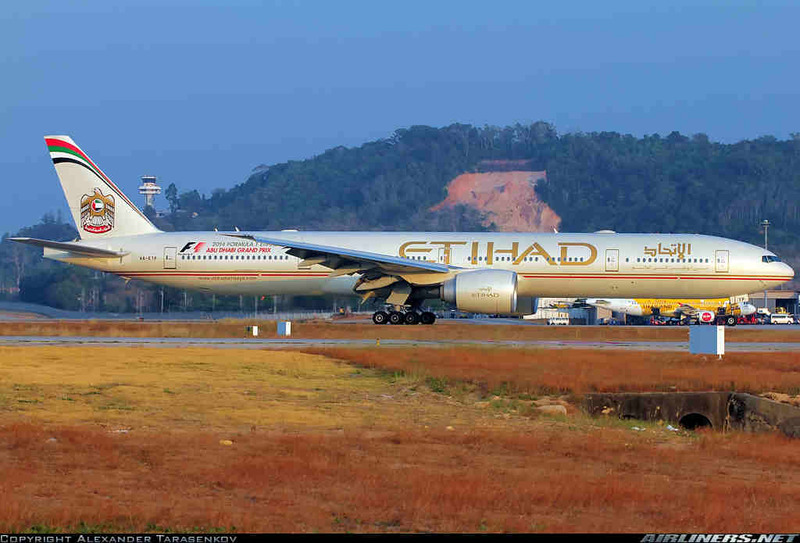 Etihad Airways will operate a 412-seat Boeing 777-3FX/ER aircraft from Abu Dhabi to Manila. Photo by Lance C Broad - YBBN Spotters Group. Etihad Airways currently operates 14 weekly flights between Abu Dhabi and Manila. The new services will bring Etihad's flights to Manila up to 17 weekly flights. Currently, using its Boeing 777-300ER aircraft for its flights to the Philippines. According to Etihad's President and Chief Executive Officer James Hogan, “The Abu Dhabi-Manila route is one of our strongest in terms of demand and has been capacity-constrained over the past few years." Hogan said that passengers are able to choose more options as they have more flights available for booking starting May next year. He also said that the three new flights will increase the market's available seats to around 2,500 seats per week. Etihad Airways will use its 412-seat Boeing 777-300ER aircraft. The aircraft has 28 business class seats and 384 economy class seats with a personal in-flight entertainment. The improved flight schedule will provide seamless connection to Etihad Airways' wide connections in Abu Dhabi. The airline operates 1,085 weekly connections to 58 destinations on the airline’s global network. “There’s huge potential to grow the visitor market, particularly from the Middle East and Europe, and we’re keen to work with our European partner airlines, the Philippines government and its tourism board to showcase the beauty of the country and the friendliness of its people. The three additional weekly services between Abu Dhabi and Manila will help us realize this ambition,” Hogan added. Flight schedule provided by AirlineRoute.net.